"I began taking the adult intermediate class in June of 2013. Miss Robin is an excellent teacher. I have been challenged both mentally and physically in this class. The improvement in my flexibility, stamina and overall muscle development has been unparalleled to any gym setting or other forms of exercise. This has truly been the one of the best decisions that I have made for myself in the last five years. My only complaint is that there are not more opportunities to take class more than once a week. Miss Robin is knowledgeable, fun and challenging all at the same time. She is consistent and persistent that I do my best each and every class. She encourages me and corrects me with clarity and pushes me to improve every class. I never thought I would be able to get back to where I am in such a short time." "Both of my daughters currently have Paige for class and are very happy. I got to watch my younger daughter's hip hop class and was impressed. I think that Paige is doing a wonderful job! They also enjoyed class when Stephanie filled in for Paige. I'm very pleased." "The instructor was in control of the group and handled the girls very well. She makes it fun and they love it." "I really enjoyed watching my daughter in Miss Ashley's Saturday morning Creative Movement class. Ashley is incredibly patient and kind with the girls. I watched as she set reasonable expectations for the 2-year olds and encouraged each new dancer to participate and follow her directions. My daughter adores Miss Ashley and her dance class. Thank you!" "We were pleased last year and are again pleased this year with Miss Adrienne. She is definitely a top notch teacher who takes her job to heart. She is firm, makes dancing fun, but pushes the girls to do the harder moves they will need if they plan to continue with ballet." "I am very happy with my daughter's progress in her class! She still just LOVES ballet and Ms. Paige!" "Just make sure you hang on to Ice! He works so well with the kids, but also keeps them in line and lets them know when they could be doing better. The students so look up to him!" "I have to commend Jessie for her way of positively engaging the students in her class. She always finds positive comments for her students and does her very best to keep their attention and involvement in the class. She doesn't get frustrated or upset and her patience and enthusiasm are to be admired!" "It was great to observe and see what they have been up to. Sonja is very patient and kind to the girls while teaching them dance. I really appreciate that!" "The BEST part about Urbana Dance is Sonja Davis!!!!!!! She left a forever POSITIVE example in my daughter's mind and heart. Thanks Sonja, for LOOKING the part and actually FUNCTIONING like the part of a Dancing Artist that you are!" "My daughter is almost 6 and this is her 4th year dancing. We have had trouble finding a good studio that was nice to deal with but also actually taught dance. We seemed to find studios in the past that were either too relaxed in their teaching styles or too demanding. I had one studio that at the end of the year at the trophy ceremony the teacher leaned down and asked my daughter her name. Urbana seems to strike a good balance and has a very personal feel. I can see a difference in my daughter this year. She talks about 1st, 2nd, 3rd position etc and loves going to Ms. Kelsey's class. For my daughter, I was looking for a school that would teach dance but not be too demanding. 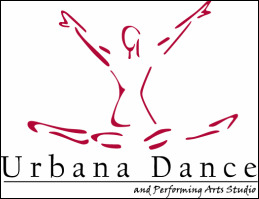 Urbana Dance has fit the bill so far. Kim & Sonja are great to talk to, very helpful and accommodating. So far, so good this year. Our favorite studio, hands down." "We have so many positive experiences with your Dance company. When Jessica was three, you helped her to separate from me and learn that she can have fun and learn without Mom being next to her. Last year with Miss Adrienne, Jessica learned a much bigger lesson, you have to work hard to be successful. She complained many times that ballet was so hard and she really had to work, but Miss Adrienne made it fun while being tough with the girls to get them to do what was needed. She didn't give our special stamps or stickers on the days the girls were chitty chatty. Jessica has been practicing and after about three weeks this summer, she mastered how to do a leap, which she could not do in class last year. She is so excited to show Miss Adrienne how she accomplished something new. We can't wait for this year to start."